Perhaps, we all dream of being aboard a National Geographic adventure but in reality it is not likely; however, Sherryanne Robertson did just that on the National Geographic cruise to Iceland, Greenland and the Northwest Passage. She was employed by the group as an economist. If you or I were to sail with them, the cost would be somewhere from $25,000-$80,000 depending on what amenities we would select. 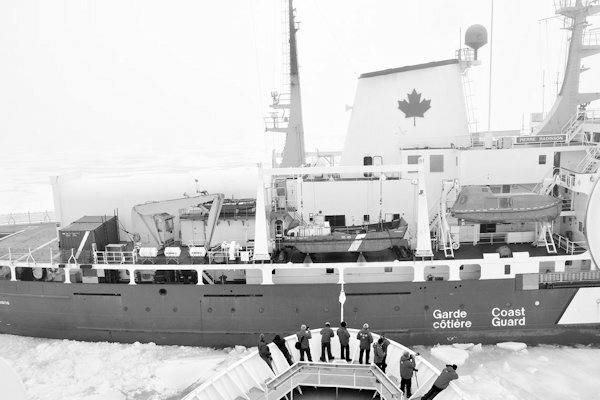 The ship consisted of 100 crew, 100 staff and 75-100 scientists plus tourists who would spend the next few weeks learning about life in the bitter cold and surrounded by ice. The Northwest Passage is a legendary quest of old. Time and again expeditions struggled to discover the passage and ended up dead. Actually, the Passage is only open for about six weeks and currently, both Canada and the United States are laying claim to it. Iceland, discovered by Leif Erikson, who sailed West to escape a murder charge, returned years later to found a colony. Today, Icelanders live in corrugated metal houses with a sometimes sod roof and everything they eat is imported-real expensive. The biggest export of the country is garbage and the local population has 30 ways to describe water. Example: "greasy water" is water that will not freeze. A telephone is called "a thread" and a jet plane is "a zoomer." Such tidbits enlarge life and are the reason for travel-see another culture different from your own. Iceland is noted for its Icelandic ponies which have five gaits and suppose to be a smooth ride. However, Sherryanne said that riding on one to a volcano left a lasting impression. Being with scientist, she traveled out beyond the decks of the ship with the birders, the geologists plus others to learn about the countries. Eleven different species of birds live in the Artic Circle and another 60 species of migratory birds arrive each year. An 8.6 mile cliff was visited to study where the bird nested. She visited an Augustine monastery built in 1126 which houses a valuable manuscript. Inside walls of the church were painted with scenes of community life. Next stop was Greenland where as an economist she interviewed people and noted their lifestyle. The country has a great internet and cell phone usage but a stratified class line-for example: if you are of the middle class, your dog sleeps in a dog house but if you are poor, he will be chained outside. The upper classes sleep on beds while the poverty stricken bunks down with the dog. Sherryanne explained about the native costume which featured a shawl, fur seal shirt, a belt, short shorts and high sealskin boots. She had an example of musk ox underpants; one pair is worn year around. Parts of the following animals are used to make the clothing: 4-6 seals, 20-25 birds, 1 hooded seal, 1 bearded seal and 1 caribou or dog. The older native class has tattoos commemorating life events-seal catch, a birth of a child, a marriage, etc. With only four hours of sunlight, the boat scientists and Sherryanne has to use time wisely. Many species of whales were sighted, ice bergs were studied, and native customs and lifestyle experienced. Curiously, to settle disputes, the Intuit men plays drums and the one who wins is the one with the loudest applause from the group-for women, they sing. Definitely, you might want to pack the house with your friends. Children are carried on their mother's back until three years old establishing a close bond between parent and child. Alas, attempting the Northwest Passage, the ship was stuck in the ice twice to be rescued by a Canadian ice breaker. After the second time, the group was to be airlifted from Yellowknife but the plane could not land due to weather conditions. Finally, they made it to Resolute and were airlifted out. Sherryanne's trip was one of a lifetime and one we will all remember. Next Coffee and Conversation at the Henderson County Library will be on December 17th at 10:00 a.m. when Susan Van Kirk, a local author from Monmouth, Illinois, will tell about her new mystery book entitled - "Three May Keep A Secret." -photos submitted by Maragret Boyce.